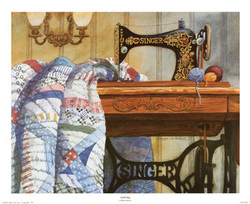 No, Susan really does not quilt using an antique Singer sewing machine. In fact, she has a couple of modern sewing machines and a couple of sergers as well. At least for the time being the sewing/quilting center has taken over the master bedroom and we have moved elsewhere. This stuff takes up a lot of room including many drawers with selections of cloth in the walk-in closet. Cloth storage uses the area right behind my radio position. So the master bedroom has sort of become "hobby central." Below is an early selection of Susan's work. Quilts These are some of the older quilts Susan has done. I expect to be adding more in the future.